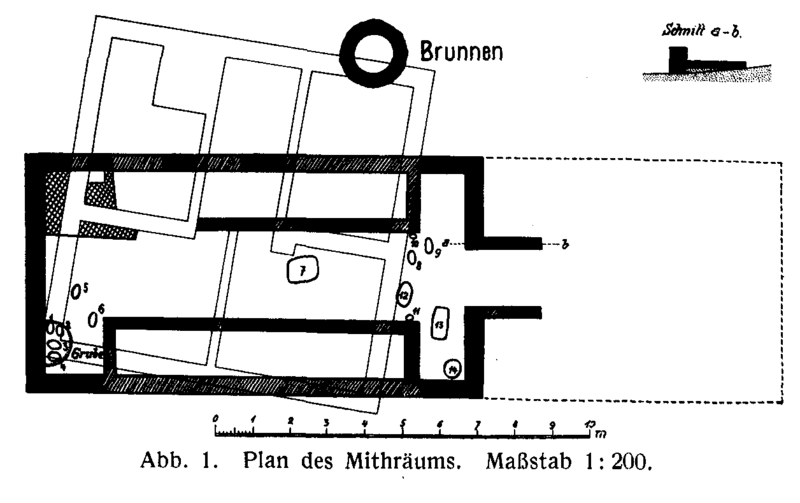 Plan of the Mithraeum, plus the new building over it. From Behn, Das Mithrasheiligtum zu Dieburg, DeGruyter, 1928, p.3. Picture of the western wall. From Behn, Das Mithrasheiligtum zu Dieburg, DeGruyter, 1928, p.3. 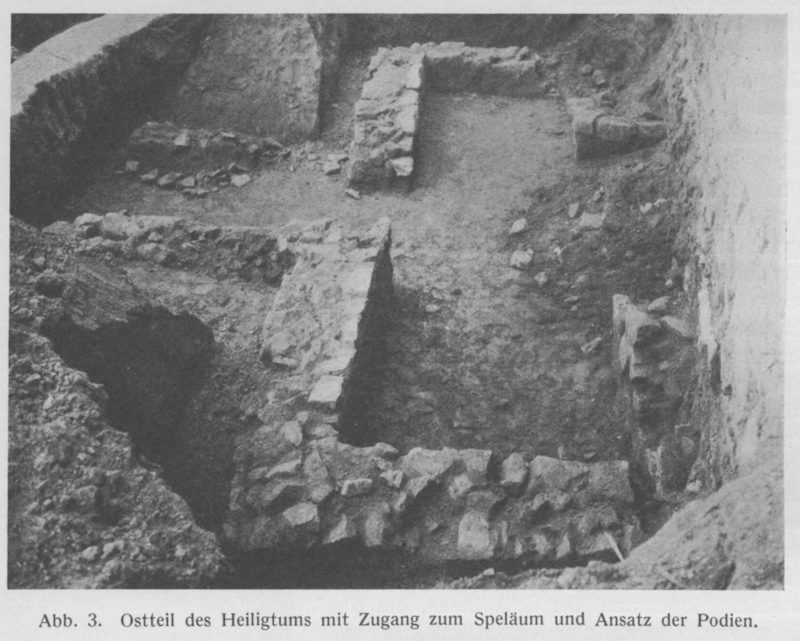 Photograph of the eastern end and entrance to the spelaeum or cave. From Behn, Das Mithrasheiligtum zu Dieburg, DeGruyter, 1928, p.3. The Mithraeum was discovered during the construction of a new building, and excavated from inside the cellars of the new construction. 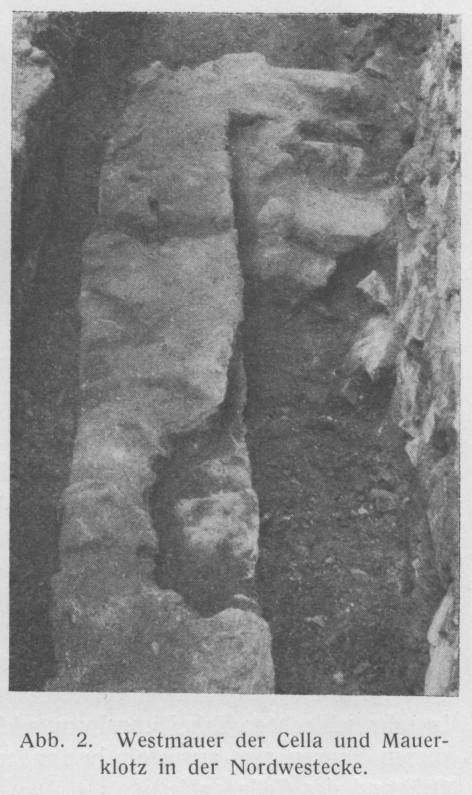 A Mithraeum found at Dieburg at the corner of the Minnefelderseestrasze (Fr. Eberstrasze) and the Forsthausstrasze in the N-E part of the town in 1926. Behn in Gnomon II 1926, 685ff; NDV II 1926, 81ff; FuF 11, 1926, 193ff; Angelos II 1927, 163ff; die Umsshau 31, 1929, 272ff; M. Dieburg; cf. Lehner in BJ 133, 1928, 248ff; Cumont in JS 1927, 122ff; JRS XVII, 1927, 233f; Nock in Gnomon 6, 1930, 30ff; Deubner in ARW XXXIII, 1936, 124; Esp. Rec. Germ., 163ff; Koepp, Germ. Rom., 58ff. See fig. 322. (from Behn). The Mithraeum is built of trachyte from Eppertshausen near Dieburg. The sanctuary in East-West orientation (L 11.20 Br. 5.60) has the normal division into a central aisle (Br. 2.40) and two benches (Br. 1.60) which begin at a distance of 1.20 mtrs from the entrance. At the beginning of these benches at 0.30 mtrs a cup had been embedded. The r. bench is connected with the base which served for the cult-relief whereas the l. bench ends at a distance of 1.55 mtrs before the backwall. 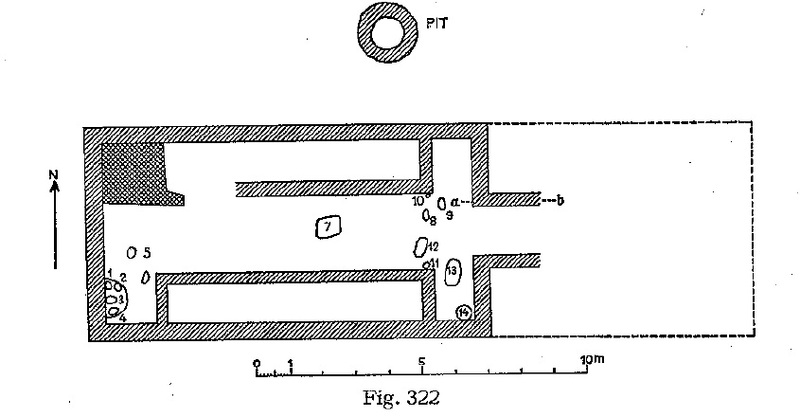 Between the backwall and the bench is a pit; another pit (diam. 1.10 D. 1.75) is at a distance of 3 mtrs N. of the sanctuary. Of a pronaos only a few traces remained which point to a wood-construction. The whole building has a 2 : 1 proportion. I feel very much inclined to back Cumont's supposition that the destruction of the sanctuary took place in 260 A.D., the end of the Limes, when the Germans made their invasions.